Offers: 2fore1 vouchers; Open Fairways discount card (50% off green fees of 2 - 4 golfers). Changing rooms with showers; Trolley hire; Professional shop; Putting green; Bar and full catering facilities. Stonehaven Golf Club has been entertaining visitors for more than 100 years and is well used to catering for individual golfers, for small groups of golfers and for large parties. We believe we offer just about the best value-for-money golf in the North-east of Scotland . Our course may be short but it challenges golfers of all standards -- and we guarantee that you will be hard pushed to find a golf course anywhere in Scotland with a more dramatic and scenic setting. The course also provides stunning views of the North Sea, of Stonehaven Bay and the town itself, and of the ancient fortress of Dunnottar Castle. Porpoises, dolphins and seals can often be seen in the bay – though we would expect that your concentration on the next shot means you may not notice them! The course is also of particular interest to geologists as it lies on the Highland Fault Line, which divides Scotland from west to east. In fact, the Fault Line splits the 13th and 15th holes with golfers having to carry their tee shots some 100 yards over a gap known locally as The Gully. Lady members and visitors are allowed to walk to the other side before playing. Mark Twain - eat your words !! Mark Twain penned a multitude of humourous one-liners in his time and one that will be familiar to most golfers was his description of the game of golf as 'a good walk spoilt !'. Well, much as I reckon I would have really enjoyed a round of golf in his company I think I would have been compelled to point him in the direction of Stonehaven - and suggest that he reconsider. The Stonehaven course provides the best of both walking and golfing and indeed in the company of a few of the locals it'll also throw up a few notable one-liners of it's own, most printable, some not !! The course is a short track perched precariously along the exposed North East Coast of Scotland, between Aberdeen to the north and Montrose to the south. The terrain is undulating ( to say the least ) and a good test for even the serious walker. 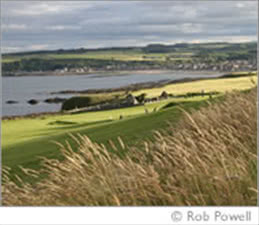 The views from the course, however, are spectacular, down to the harbour area of Stonehaven itself and along the ragged North Sea coastline edging the course northwards. The coastline cannot hide the North Sea's never ending mission to bite off as much as it can chew of the land within its reach. The course is just about winning the battle but you do get the feeling while playing that it's only a matter of time, a long time thankfully, before you, your trolley and your golf partners might find themselves floating off to Norway, perhaps while still putting out on the first green ! The walk and the views are complemented by a very interesting game of golf at this course. A short course indeed, but by no means an easy course, it has lots of ammo in it's arsenal to protect against even the lowest of handicappers and the loudest of raconteurs. A number of holes are truly spectatular, quite unlike anything you'll get to play anywhere else. Tee shots over gulleys and along cliff edges will have you rummaging in the bag now and again for a 'tattie' replacement for the Pro V you've just sent sailing into oblivion. Successful negotiation of the challenge allows for a period of thoughtful appreciation of the view from the tee while attempting not to break out into an ear to ear grin as your partner gingerly tees up. Small and tight greens, some raised, can be difficult to hit but are a pleasure to putt once reached. Good surfaces and generally consistent, requiring a keen eye to spot the borrows, if in doubt the ball will dive towards the sea side of the hole ( or so the locals will have it ). Fairways are well turfed and provide no excuses for poor shots, but positioning off the tee is everything on this track. Although short, the course demands a reasonable drive off most tees in order to significantly improve your chances of protecting your handicap against the test. Out of bounds comes into play on all but one of the 18, and not just off the tee on some holes, adding to the challenge. All in all a very pleasant walk and a most interesting and pretty unique game of golf. Mark, if you're ever in town, you should try it ! !